The Dutch Hen House boasta a quaint hip roof; making it look like a miniature barn. The hip roof optimizes usable interior space. 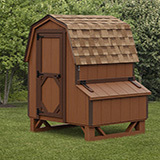 All of our chicken coops can be customized. 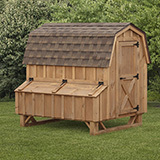 Please feel free to call us to ask questions before you buy a chicken coop. Our staff is trained and knowlegable or will find out answers to your questions about your new coop.